Back in December of 2009 I wrote a blog article entitled Do No Evil, A Case Study in which I discussed in great detail my thoughts on Google's acquisition of a little known company called Etherpad and their technology which allows really real time collaboration. Initially the Etherpad team was pushed over to the Google Wave product, but my gut instinct was that Wave is too complex of a product and that putting the technology into Google Docs was a better solution. Now, Google announces that the really real time collaboration technology is now in it's flagship Google Docs products on an opt-in basis if the administrator has pre-release features turned on! - Key features: New ruler for margins and tab stops, floating image placement, new commenting structure in the document margin and instant messaging in the sidebar. - Performance improvements: Documents now supports character-by-character real-time collaboration. - Key features: Faster loading and scrolling of large spreadsheets, drag & drop columns, formula editing bar and formula highlighting, auto-complete, improved sheet navigation. - Performance improvements: Improved speed of initial loading, scrolling, cell freezing, collaborative editing, and more. The integration of the really real time collaboration technology puts Google in the lead for teams needing to work collaboratively together. Access Marketplace from your administrator control panel by clicking on 'Add more services' to see the option to shop the Marketplace. 1) Click "Add it now"
The updated website is quite a bit better in its information - each product has a webpage with an image, potentially a video, description, user reviews, and a specifications section. The specifications are important as it describes how the product integrates with Google Apps. Of course, I will continue to document and highlight the best integrated apps on my Google Apps Integration page. What I'm looking for is not just utilization of the login, but deep utilization of the Google App products as the foundation. In other words, a good integrated app utilizes Google Mail/Contacts for e-mail and hosting contact information; Google Calendar for dates and scheduling; Google Documents for writing, spreadsheets, and charts; Google App Engine for database, Google Picasa for pictures; and Google Sites for web page building. A couple of nice improvements were added to the Google Apps products during the month of February. A clickable save button "Save now" means your document has edits which haven't been saved yet and the timestamp lets you know when it was last saved. You can either wait for autosave to happen after a few seconds, or you can manually save at any time using the keyboard (ctrl S on PC, cmd S on Macs), save button, or by going to through the file menu. A disabled button reading “Saving” means your document is currently being saved, and should complete in a second or two. A disabled button reading “Saved” means all data in this document is now saved, and the timestamp tells you when the last change happened. You can safely exit the application or continue editing the document. A new icon has been added to the to the icon bar within the google apps - docs, spreadsheet, and presentations that allows the user to temporarily store clips for up to a month. The user can then paste the clip into any of the other documents across the suite of applications. When pasting, simply select the icon again and a drop down appears of the clip with a brief clip intro - hovering over the intro pops open a window with the full text of the clip. Selecting the clip intro pastes the data into the current application. A great way to grab and move data between multiple browsers or computers! I just happened to have five of the following six turned on in labs (all but number 2) - these no longer appear in the labs menu and are now part of the continuous improvement that is Google Mail! 1. Search Autocomplete - Gmail will suggest terms to help you find your item more quickly - simply start typing in the search entry box at the top of the page and a list of possibilities will magically appear! 2. Go To Label - If you have keyboard shortcuts enabled, typing in the search box will autocomplete and suggest a label name - same functionality as number one, but will also display mail labels as well as content during your search. 3. Forgotten Attachment Detector - Gmail looks for phrases in your email that suggest you meant to attach a file and alerts you if it looks like you forgot an attachment - my absolute favorite lab - has saved my bacon a number of times - glad to see that it "graduated". 4. YouTube Previews - If you receive a message with a YouTube link in it, you can now watch the video right below the message. 5. Custom Label Colors - Create your own custom label color. 6. Vacation Dates - Set your dates in advance, enable vacation responder and Gmail will turn it on when the date arrives. The Google announcement with various links to helpful pages and examples. It's finally here - the Google G-drive has been implemented into every Google Apps account as well as every public Google account. As noted on my January 12th announcement, each user has a 1gb virtual drive in the cloud they can use to store their personal files. * the user will be able to select multiple files using the shift for inbetween selects and ctrl for specific selects. * file limitations - the help file said 100mb, the announcement said 250mb - the actual limitation is a file size of 1gb!!! 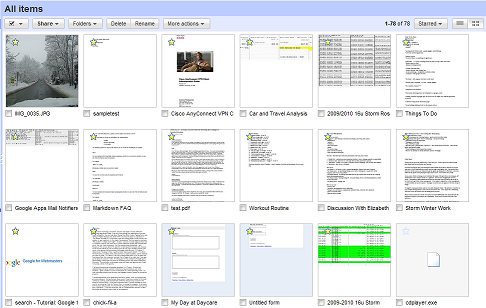 Which brings up a new feature - the ability to view thumbnails of files. In the upper right corner is a list view icon and a thumbnail view icon. Selecting thumbnail view displays the files using their thumbnail for Google docs, spreadsheets, forms, presentations, PDFs, and pictures. Other files simply display a file icon. Over the past week, Google has been rolling out the latest version of its Chrome browser to 4.0.249.78 (36714). Speed improvements (400% faster than the initial release of Google Chrome), extensions to cool utilities and the ability to sync your bookmarks across multiple computers lead the list of what's new. In addition to speed (do we really care about anything else?) is the release of extensions and bookmark sync. Chrome Showcase - manage your tabs and tab preview. While those are helpful - my two favorites are Google Dictionary (by Google) and 1-ClickWeather for Chrome. 1-ClickWeather for Chrome was developed by the folks at the Weather Channel - they've been making widgets, gadgets, and notification icons for years - so it comes as no surprise that they have one of the best Chrome Extensions to date. 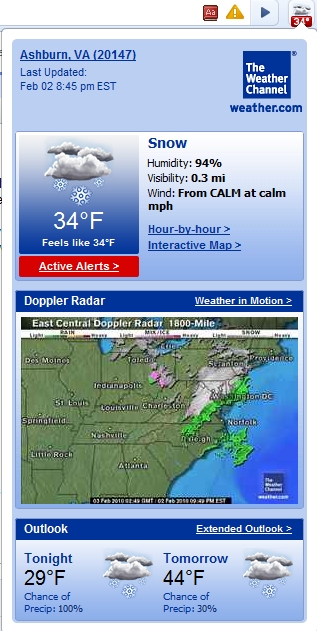 The extension displays as an icon next to the browser page and customize/control icons in the upper right corner of the browser showing a weather picture and the current temperature. One click on the icon drops down the current details, Doppler radar, and the current outlook for the remainder of the day/night as well as tomorrow. In addition, it has various hyperlinks to detailed information and active alerts. Located within the Customize and Control Google Chrome icon (that's the wrench icon) is the ability to synchronize your bookmarks across all computers. Selecting this option copies your bookmarks to your Google Gmail account. Go to another computer running Chrome, select the synchronize option, log-in, and like magic... all your bookmarks are there! This works great among a few different computers that I use for personal and business use. The downside to this feature is that it currently only works with Google Gmail accounts and not Google Apps accounts. At some point, someone at Google is going to wake up and get smart by figuring out how to link a Google Gmail account with a Google Apps account so that you have easy access to various files and global settings. Did I mention how fast the new Google Chrome is compared to every other browser? All that speed does come at a price - memory. Yes, Google Chrome and all those extensions are memory hogs - but that's ok as users start to live in the browser with limited need to go outside of the browser. Part of the Google Apps suite, Google's Sites is a great product for developing internet and intranet (wikis) sites. Easy to use, Google Sites allows rapid development of team collaborative information. One of the challenges of making a product easy to use is to balance simplicity with flexibility. Simplicity is adding content by utilizing wysiwyg (what you see is what you get) editing, simple gadget insertion for functionality and document integration versus the open flexibility of generating HTML commands and script programming. Google's Sites makes a very good attempt to be simple and flexible. Google's editor is wysiwyg and creating web pages is easy as typing an e-mail. Additionally, thousands of gadgets add all sorts of content from sports scores, stock tickers, music, videos, pictures, charts and graphs, etc. If that's not enough, Sites allows integration with the entire suite of Google Apps Docs - documents, spreadsheets, and presentations. In order to be flexible Google Sites allows direct HTML manipulation for the coding geeks that enjoy writing cryptic HTML tags. Each page's HTML content is available by selecting the edit HTML icon within the page content. However, adding scripts always generates the dreaded script error - "Your HTML either contains unsafe tags (iframe, embed, styles, script) or extra attributes. They will be removed when the page is viewed." Bummer! There's a wide array of third party gadgets, widgets, and tinkering that can be done with just a little bit of scripting. Forget about what you've been told or Google's tyrannical message - scripts can be used in Sites - you just have to know how by receiving a little help from others on the web - the following is an expanded example from Mori's tips and tricks site. I wanted to insert a Yuuguu widget into my Google Apps page to make it easy and enticing for potential customers to see a demonstration. 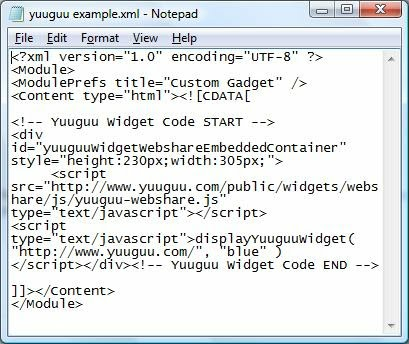 Yuuguu is a fantastic piece of free or low cost software that allows people across the internet to view your computer screen. It's time to display the code results onto your Google Sites page - this is done by going to the page you want to display the script and inserting a gadget. Select Insert --> More gadgets... --> Add gadget by url and paste the link address. Make sure to modify the width and height accordingly - preview your gadget and when ready select the OK button. Final results - a script on your Google Sites page!!! !